Chocolate covered strawberries are a Valentine’s classic for a reason. They’re so good! But it’s always struck me as bad timing based on how difficult it is to find a decent strawberry in New York in February. 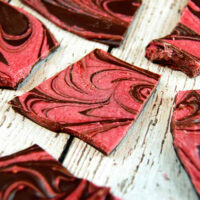 That’s why I came up with a recipe for Swirled Chocolate Strawberry Bark. 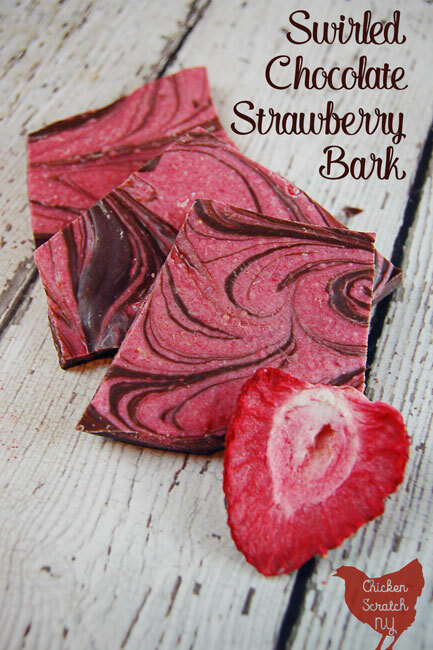 I wanted to have a real strawberry flavor in the chocolate bark. Artificial strawberry has it’s place and it’s in those strawberry hard candies that Grandmas always have. When I’m not walking down memory lane I’ll go for the real thing. Turns out it wasn’t that hard to get the strawberry flavor into the chocolate! 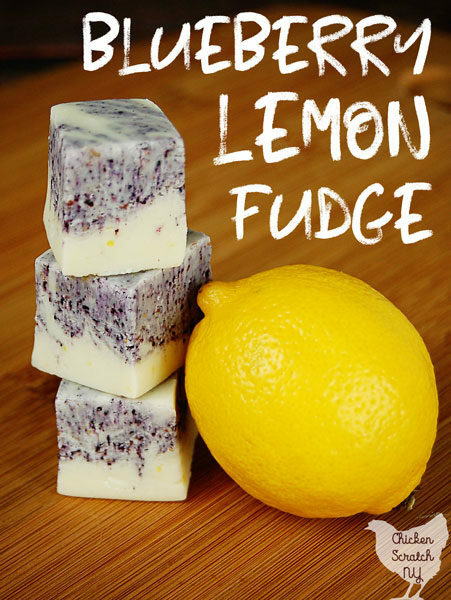 I used the freeze-dried fruit technique from my recipe for Blueberry Lemon Fudge. This time I used freeze-dried strawberries from Aldi’s. They were with the regular food so hopefully it’s not one of the awesome seasonal items that disappear forever after a week. Freeze-dried strawberries have a very strange texture. They turn to powder very easily, if you don’t want to pull out the food processor you can easily push the strawberries through a metal sieve. Unlike the blueberries they are a very uniform pinky-red color. The food processor does make things very dust so take care not to inhale a cloud of strawberry dust! I went high-class with Ghiradelli melting wafers but this recipe will also work with almond bark or candy melts. You need two colors, white to mix the strawberries into and dark to make the base. The darker the better, it will give you a stronger contrast with the strawberry and just look prettier. 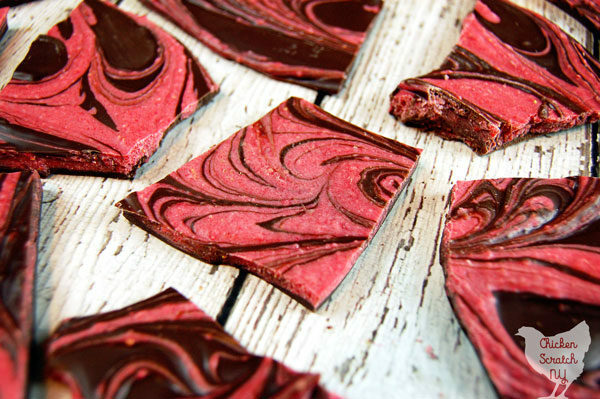 The strawberries do make the chocolate thicker and they add a bit of texture so it’s not as smooth as a 100% chocolate candy but you shouldn’t let that stop you! Swirled desserts are so pretty and really easy. For me the hard part is knowing when to stop swirling! You won’t mess up the flavor but you can swirl it so much you end up with one muddy looking pinkish-brown blob. 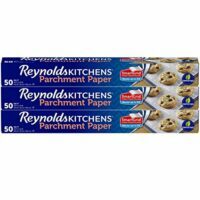 I made mine fairly thick, it’s about 1/4 inch thick in most places, so I recommend breaking it up into smaller pieces than you would with a thinner bark. It’s very rich and it has a lot of flavor so you don’t need a lot at all. The biggest tip I can give you is to be prepared before you start melting things. If your house isn’t freezing you’ll have some time to play but I like to be cautious. 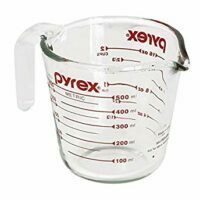 Have your counter covered with parchment and your measuring cups and off set spatula ready to go and you strawberries ground up and sifted. Chocolate melts are pretty forgiving but you can ‘burn’ them if you heat them too much, you’ll know what happened if it gets very thick and chunky. 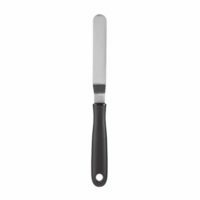 You can usually save it by throwing in a little coconut oil and stirring until it’s smooth. Whatever you do, don’t let any water get into the chocolate or it will seize up and it’s ruined. 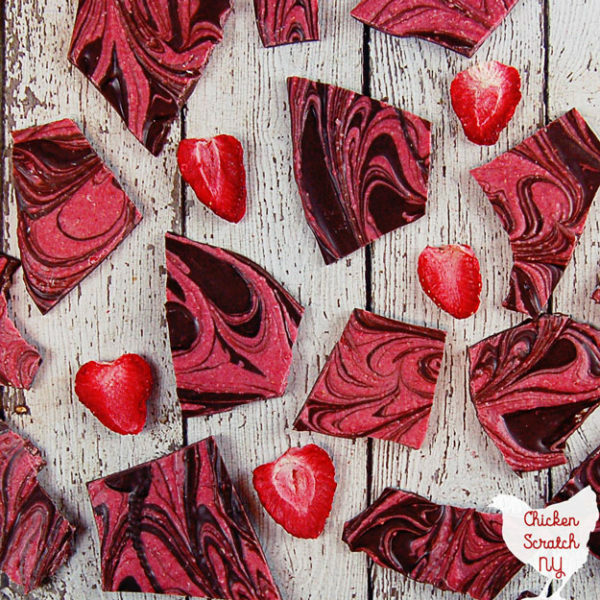 Chocolate strawberry bark is an easy and stunning dessert, perfect for gift-giving or enjoying yourself. It's foolproof and comes together in minutes with only 3 ingredients. This looks like it would be perfect for Valentine’s Day! Sounds easy too! I’ve always thought that was strange too that strawberries and chocolate are so popular for Valentine’s when strawberries aren’t even in season. Lol. Looks like you figured out the trick. This looks awesome! These are so pretty and I love how easy to make they are. A perfect gift for that someone special. Well isn’t this a fun treat. I think it would be perfect to give and receive for Valentine’s Day…..so much better than bought treats. Saving this quick and easy bark for Valentine’s Day! I love chocolate covered strawberries so I think it’d be a huge hit! Wow, these came out gorgeous Alecia. Very creative. I keep hearing about freeze dried fruits but haven’t played around with them yet. Wow! This is genius! I was recently thinking the same thing about chocolate covered strawberries for Valentine’s Day. What a great way to solve the problem. I love chocolate and strawberry together! It sounds like an easy dessert idea for Valentines Day! This would be so fun for Valentine’s day! I love freeze dried strawberries for Valentine’s desserts. They’re SUCH a gorgeous color. I bet this would be good with raspberries as well. Ohh. this reminds me that I want to make some bark for valentines day! Yours is so pretty. Love the deep red color of it! These are so perfect for a Valentine’s Day dessert!! So pretty and SO simple. Sign me up!! Can’t wait to try this recipe! Strawberry bark sounds so simple and delicious! I wish I could try this out but for some reason, my stomach doesn’t like strawberry and chocolate combo. I wonder what it would taste like using cherries instead. 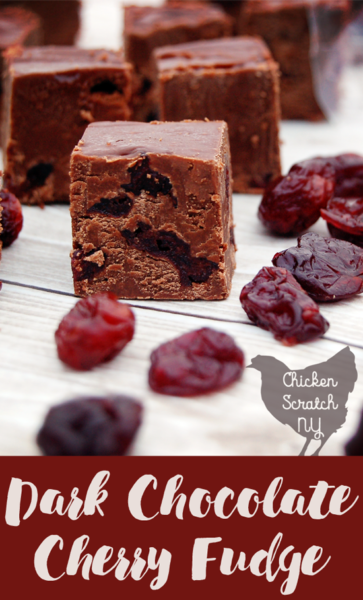 Have you tried this with cherries? I can’t get over how gorgeous these look. What a fun treat for Valentine’s Day! I’ll have to make this for my granddaughters. They love strawberry anything! These look tasty! Love that combo and color!